But that's otherwise about it from us. We'll be back with all the usual text and radio coverage of Tuesday's Championship fixtures from around 19:00 BST and, if the EFL Trophy is your thing, we'll have live commentary of the final at Wembley between Coventry and Oxford tomorrow too. If you're only just joining us, you've missed a footballing feast this afternoon. 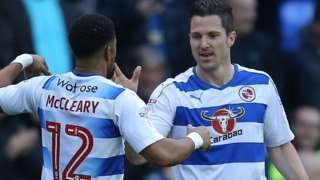 Yann Kermorgant's strike sees Reading beat play-off rivals Leeds and move above them into fourth in the Championship. And here's how the Championship table looks after today's action. Confirmation, of course, that Reading have leapfrogged Leeds and are up into fourth. Matt Ritchie scores the winner for table-topping Newcastle against Wigan, while second-placed Brighton earn a narrow win over Blackburn. Huddersfield lose to struggling Burton but remain third after Reading beat Leeds. Rotherham are relegated to League One after a 1-0 defeat by Fulham. There are wins for midtable Aston Villa and Brentford and Wolves edge closer to safety with a win over Cardiff. In the early kick-off, Barnsley score a last minute equaliser to deny neighbours Sheffield Wednesday three points at Oakwell. Ready for a final run through of Saturday night's Championship headlines? It's a massive win. It's a massive confidence boost. To get a win against Leeds, who we now go above, is great and you can hear it in the crowd. It was a tough fight in the second half. We knew they'd play a bit more direct and we had to make sure we didn't concede, but we're really happy. Hopefully we'll finish in the top six and then we'll see after that. "Leeds have thrown everything at Reading and every one of those Reading players stood up to it and defended for their lives in that second half." One final puff on referee Keith Stroud's whistle and the points are Reading's. If this was indeed a dress rehearsal for the play-off semi-finals it's the Royals who now have the edge. But, to a massive roar from the home support, Leeds give away a free-kick and Reading can eat up a few more seconds. Reading clear the corner but Leeds are back in possession soon enough, sending another ball deep into Royals territory. We're halfway through the added period. And they have a corner too. The Royals have a throw-in midway inside the Leeds half on the left-hand side - and they're in no hurry whatsoever. But again the delivery doesn't quite cut the mustard and Reading have a goal kick. There'll be six minutes of added time! Now Yann Kermorgant has gone into the book for dissent after giving away a cheap free-kick on halfway. Kemar Roofe goes to ground under a challenge from Yann Kermorgant in the penalty area, and the Leeds fans are up appealing for a foul, but the referee isn't interested. Birmingham City boss Gianfranco Zola said he "didn't see Ipswich scoring" in his side's draw at Portman Road. Mick McCarthy's side levelled when Grant Ward's overhit cross caught goalkeeper Tomasz Kuszczak out. "We looked like we were cruising and I honestly didn't see them scoring because we were defending very well," he told BBC WM. "Tomasz could maybe have done better on the goal but he saved us against Newcastle. It's ok, it's part of the game." Ipswich Town make it nine draws in 12 games as they hit back to deny Birmingham three points at Portman Road. A final throw of the Leeds dice - Kemar Roofe is on for Ronaldo Vieira. They've gone very, very direct in the last few minutes, but still no joy in front of goal. Yet. Danny Williams is yellow carded for climbing all over the back of Chris Wood - a foul which also presents Leeds with another opportunity to chuck the ball into the Reading penalty area.